La Dolce Vita: This Week's Fabulous Room-- A Day Early! I'm bringing you this week's "Fabulous Room" a day earlier because I have a special surprise in store for tomorrow in collaboration with domino! Lacquer has long been a favorite design element of mine and I am dying to do lacquered walls in a client project. I'm actually proposing it for a client's dining room tomorrow, so we'll see. In the meantime, I'll just keep coming back to this gorgeous room with lacquered walls and a lacquered ceiling in crisp white. 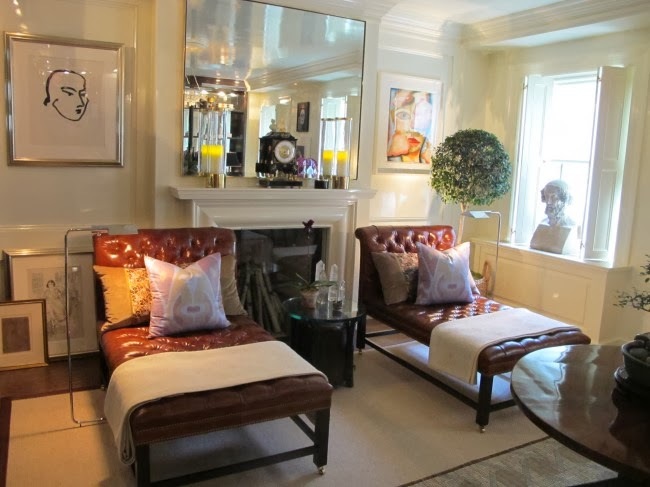 Designed by Aman Carson for the 2010 Kips Bay Showhouse. Designed as an "Art Collector's Room", the space features an eclectic mix of art and furniture. The palette is perfection-- neutral with pops of rich color, creating the perfect background for the beautiful assortment of art. Stay tuned for tomorrow's special post in collaboration with domino! I am SO inspired by the white lacquered ceiling. Usually you see very brightly colored ceilings, but this is just as glam but not nearly as in your face! love love love! For me, this is a perfect look. I simply do not like "flat" paint or the way it holds up to wear. This room is lovely and good luck on convincing your client.